I’ve been home from the NSTA conference for close to a week now. I’ve spent much of that time recovering and getting myself back on track. My shoulders have been sore all week from packing my laptop around the convention center and also packing around all the materials I got loaded down with at the booths. I also picked up a head cold (seems like every time I travel by air, this happens). I’ve since been following up on leads that I got at the conference, such as applying for grants I heard of, checking out opportunities, trying out new forms of Web 2.0 technologies, etc. Today I’m finally getting back to editing videos with the episodes on beryllium refining next up. The trip back was uneventful. I ran into quite a few teachers in the airport taking my same flight from Philly to Salt Lake City. Some were from Utah, others from Reno or Phoenix or other connecting flights. I spent much of the flight napping or watching remastered Star Trek episodes (you really should check out the remastered “Doomsday Machine” episode – the planet killer finally looks like the “devil incarnate” that Com. Decker describes it to be). 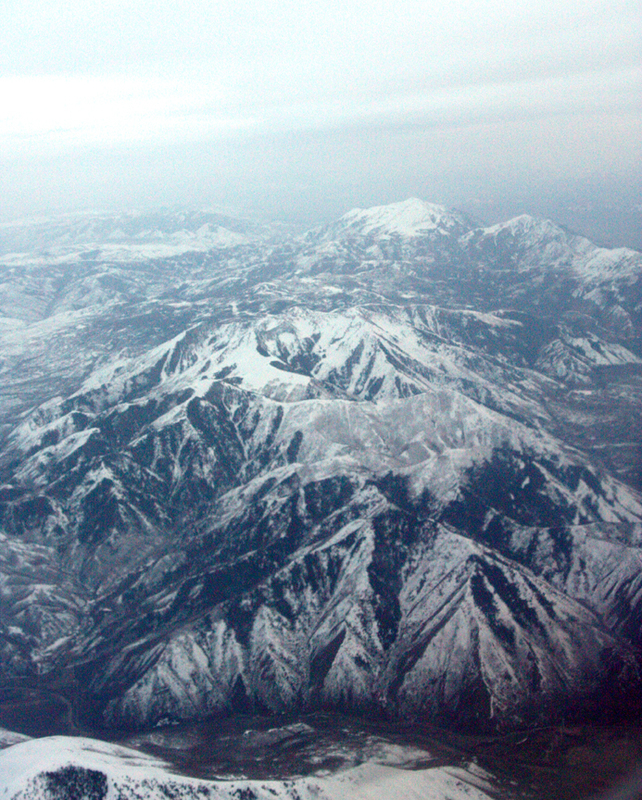 As we approached Salt Lake City, I saw the Wasatch Mountains ahead and I had a good view of the southern Wasatch down to Mt. 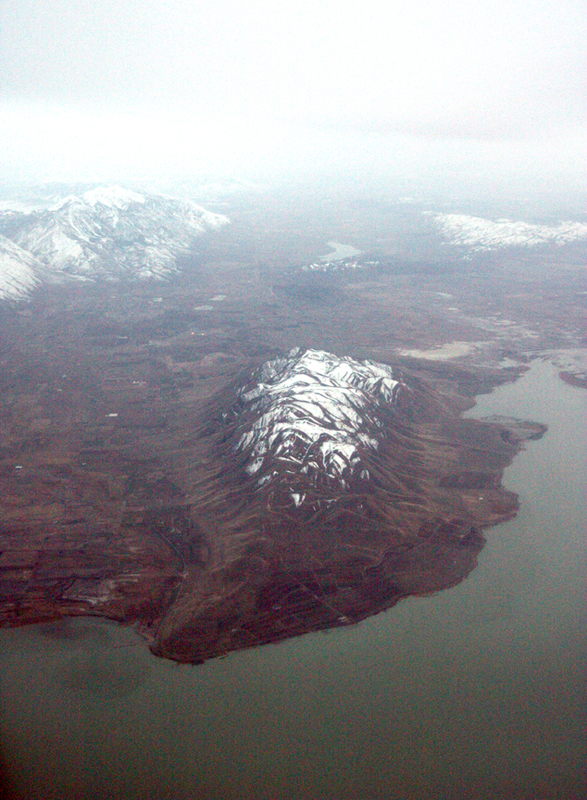 Nebo as we flew over Hobble Creek Canyon, then turned over Utah Lake and headed north along the Oquirrh Mts. I could see that we would be in perfect position for photos of the Bingham Canyon Copper Mine (the biggest hole on Earth) so I snapped quite a few photos just as the sun set over the Deep Creek Mts. on the Utah-Nevada border. 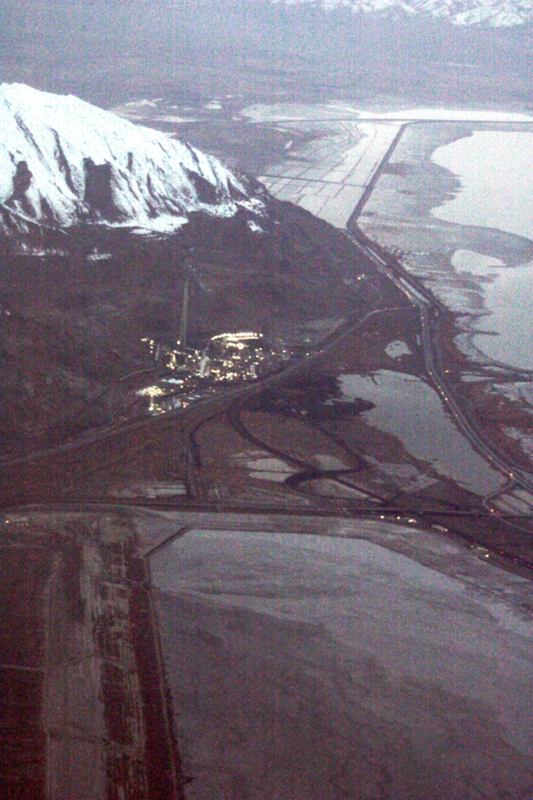 At some point, I hope to have some team(s) from Copper Hills High School or Bingham High School do episodes on the history and current operations of the Kennecott mine (now owned by Rio Tinto). I’ve been to the mine and through the concentration plant before, and it’s quite a process. Once the ore is crushed in ball mills, the copper is floated to the top of settling tanks using a floculent agent, then pumped to the smelter at Magna (where the large smokestack is just north of the Oquirrhs along I-80). There it is melted and poured into ingots for electrolytic purification. In addition to huge amounts of copper produced each year, they also produce zinc, molybdenum, and even 30,000 oz. of gold. Since the ore is less than 1% usable metals, it takes a gigantic operation for the economics of scale to be profitable. 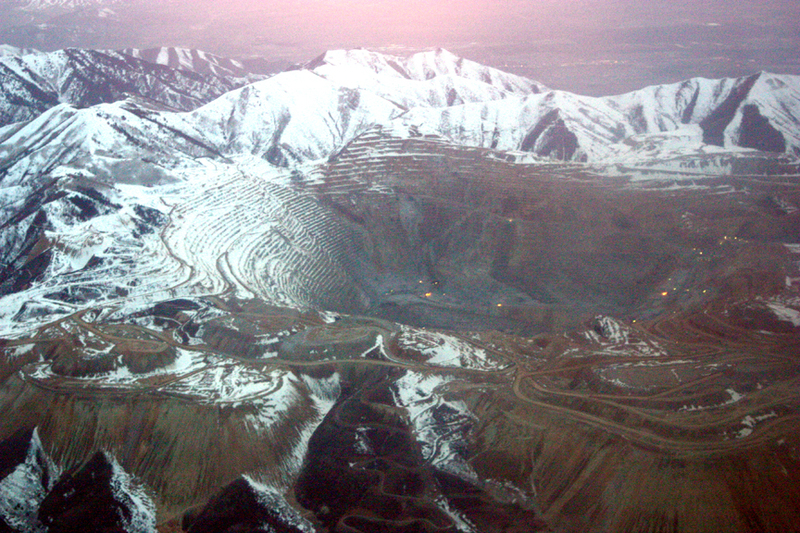 Bingham Canyon copper mine and Oquirrh Mts. At the rate of two topics per month (which is pretty ambitious) it will take at least ten months to complete all these topics, or maybe by the end of 2010. I have much of the media (videotaped tours, photos, etc.) that I need for these topics already, it’s just a matter of creating the scripts, narration, and doing the editing. 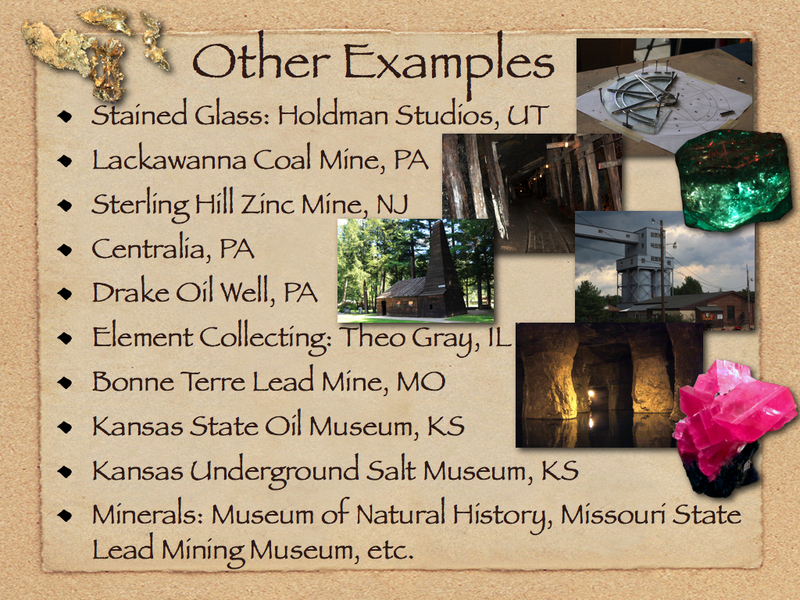 Once summer comes, I’ll be out gathering more information on other mining sites and adding to what I already have on these topics. By fall (pending funding) there will be additional teams of students out collecting more material. My overall goal (if you look at the post from November where I submitted the grant to NSF) is to produce over 100 episodes by the end of 2012, and by then to be covering Utah, Nevada, and Colorado. Sometimes I look at the mountain of work I have before me, then I think of how much the Periodic Table videos are already being used and realize the potential this project has. 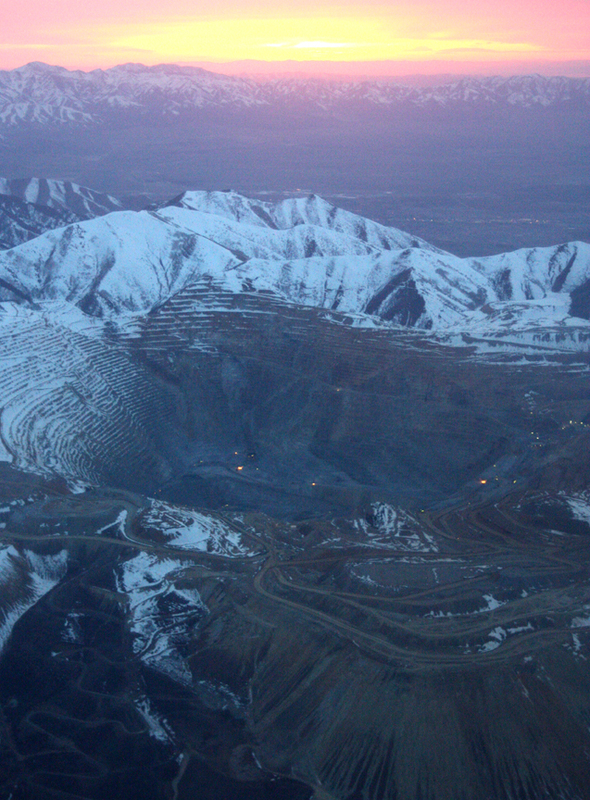 I also remember that the Bingham Canyon copper mine began as a mountain, too, and now it’s a gigantic hole. It’s only taken 100 years of constant digging . . . . 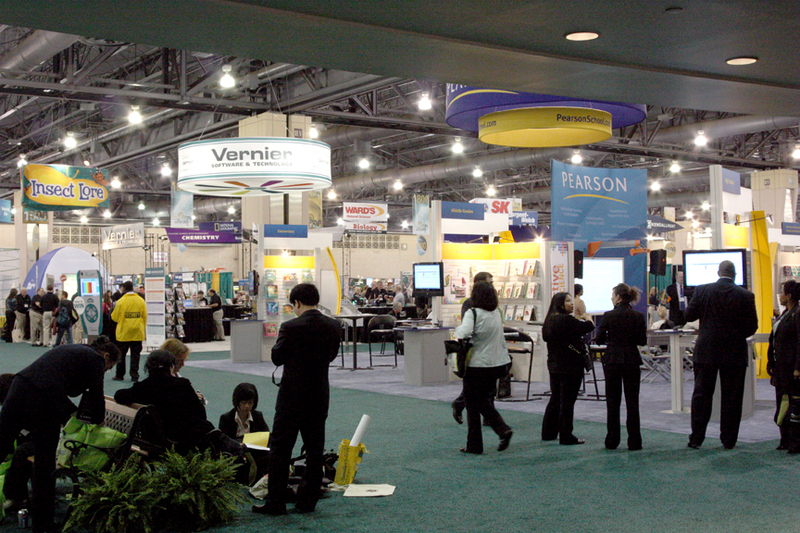 The NSTA conference in Philadelphia is over the convention center crews are tearing down the displays and signs and the teachers have pretty much disappeared, many flying out this morning back to their home states. I’m still here because this building has free WiFi for attendees, so I’m writing one more blog before flying back to Utah this evening. I attended Eric Brunsell’s session this morning. I’ve known him since 2000 when he was with Space Educators directing the Solar System Educators Program at JPL. He is now a professor at the University of Wisconsin-Oshkosh and presented on the stages of inquiry learning, which isn’t limited to the narrowly defined scientific method (PHEOC) steps we learned in school. There are many methods of inquiry that scientists use. I talked with Eric a bit after, dropped off my evaluation forms from the day before, and hoofed it to the other side of the convention center (it takes up two city blocks) to a presentation on how and why to use Wikis in the classroom. The presenter had excellent ideas that will help the collaboration component of this project. I then attended the final session to learn how teachers in Tampa, Florida are using podcasting, video casting, and stop motion animation in their classrooms. Now I’m out in the hall blogging. My wife just called to suggest some corrections to last night’s blog (I was very tired and not all of it made sense). It will take me this next week to follow up on all the leads, visit all the websites, and assimilate all the information I’ve learned here. I have to say that the experience has been well worth the time, effort, and expense. Next year’s conference is in San Francisco. I hope to be there. 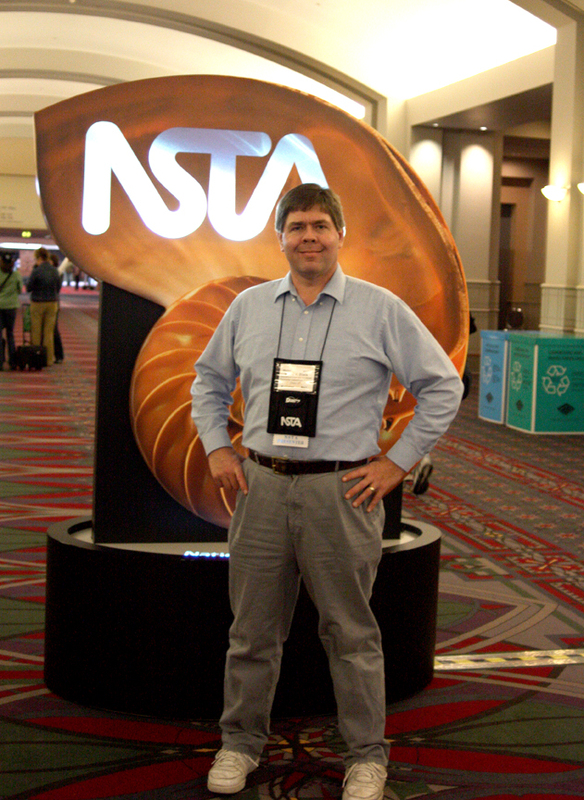 I have completed my third day at the NSTA annual conference in Philadelphia and I’m tired . . . emotionally and physically. As the old Jerry Rafferty song went, “Winding my way down on Baker Street, I’m light in my head and dead on my feet, well another crazy day . . . .” I’ve pushed myself to the limits to make the most of this trip to Philadelphia by presenting The Elements Unearthed project this morning and by visiting the Exhibition Hall this afternoon and talking to everyone I can anywhere I can. I arrived at 8:30 to my designated “room” in the rabbit warren of cubicles on the ground floor of the convention center. The rooms are divided by moveable partitions, and the sound of all the presenters just bounces off the ceiling so that it’s a bit of bedlam, especially if you’re trying to hear a soft-spoken petite lady speak when some guy is practically shouting next door. I was worried about people being able to hear the videos on my laptop speakers (I know my voice is loud enough). I contacted the AV people yesterday and arranged to have computer speakers placed in my room, which was great since my cubicle was also directly under two large industrial ceiling fans. Fortunately, they weren’t on this morning so I didn’t have to compete with them. I got myself all set up – my 17 inch MacBook Pro hooked up immediately and instantly showed on the projector, so all my worries and Plans B and C were unnecessary (I had some trouble getting it to work on a projector last summer). I didn’t have to lug my old laptop all the way across the country after all. As 9:30 approached I became worried that no one would show up. No one was coming to my room, yet the session across the hall was packing them in – standing room only. Later I discovered it was a session on Edible Science. I guess science teachers are all hungry. I could only offer food for thought. But with two minutes to go, a professor from a college in St. Louis came in who’s doing science journalism with his science education students, so at least I had an audience. Then two more came in and as I started a few others trickled in, until I had about 12 attendees overall. Not a bad crowd. I’d told a lot of people over the last two days about my session, and none of them came, but at least they know about the project now. The actual presentation went well. The computer speakers were better than nothing, but were a bit blown out and distorted. I went over by a few minutes, but I did have several attendees talk to me afterward and I think overall it went well. I said all that needed to be said, showcased what my students and I have done, and helped them see how to set up and maintain a large-scale project for a professional audience created by high school students. I packed up after the presentation and crashed in a quiet corner of the convention center, then did my post about day two of the conference. I went to the Reading Terminal Market across the street, with its wonderful crazy mix of food stalls and produce stands, with everything from Thai to Greek to Philly cheesesteaks to Amish sausage sandwiches (which is what I had – with a Sasparilla to wash it down). I was heading back to the exhibitors’ hall when I ran into Kay Ferrari, who is over the JPL Solar System Educators Program (I ate dinner with her and the SSEP-ers last night) and we talked about her projects as a co-PI for some NASA astrobiology initiatives and the possibility of interviewing some of the scientists working on astrobiology experiments. I braved the hall and went from stall to stall, talking to anyone whose materials seemed to correspond to this project. I got some great leads, some possible leads, and some “Yeah OK thanks for stopping by” head nods. 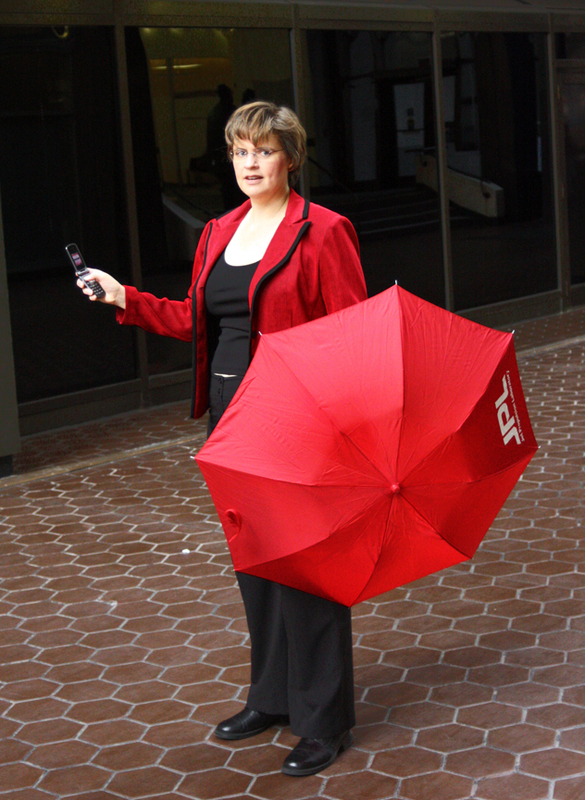 I did a preliminary interview with Clark County School District in Los Vegas (just in case). The highlight came as I was talking to a business owner that creates interactive digital textbooks (you know from my iPad post what I think of these) when two men stopped and started joking with the owner about how their textbook needed to be interactive and if they were going to have an iPad version. I didn’t recognize one of them until the other pointed out who he was – no other than Paul Hewitt, author of the popular “Conceptual Physics” series of textbooks (which I taught from in my physics classes at Juab High School way back when. 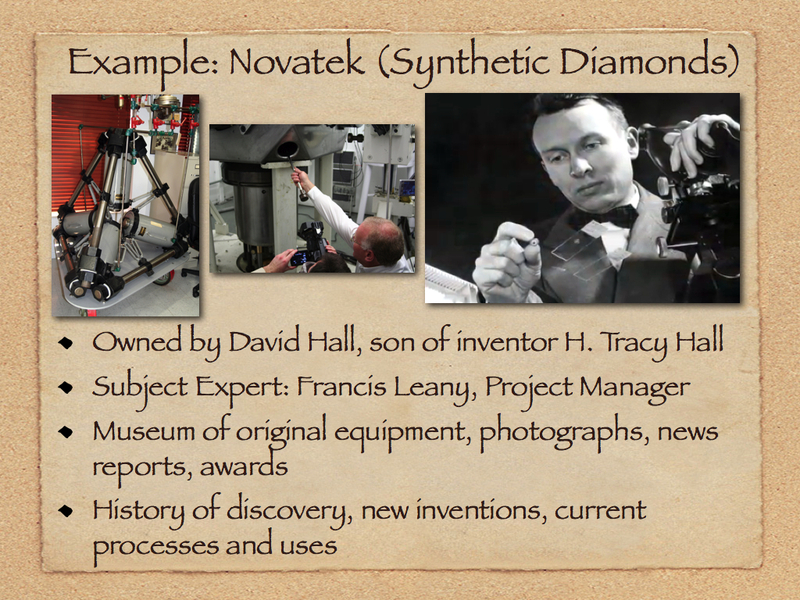 I spent a total of three weeks over three summers learning how to teach his materials). He’s as funny in person as he is on the videos I’ve seen. I stayed on the dealer floor until they literally were rolling up the carpet under my feet and the exhibitors were tearing down their displays. I got a few more contacts even so. I then talked the ears off of a teacher from New Jersey who teaches in a small town school (yes, New Jersey does have small towns. There are even farms in New Jersey [that was for all the Utahns that think, as I used to, that every square centimeter of land is covered with asphalt east of the Mississippi]) and her experiences have been very similar to my experiences in Tioga High School in California and in Juab High School in Utah. Rural schools have a unique set of problems that aren’t fully appreciated by urban or suburban educators. It’s getting dark outside (it’s 7:14 here) and now I have what seems like a ton of materials, two computers, and two cameras to carry back to Darby. As I follow up on all these contacts, time will tell if this four-day marathon will be worth it. I think it will. 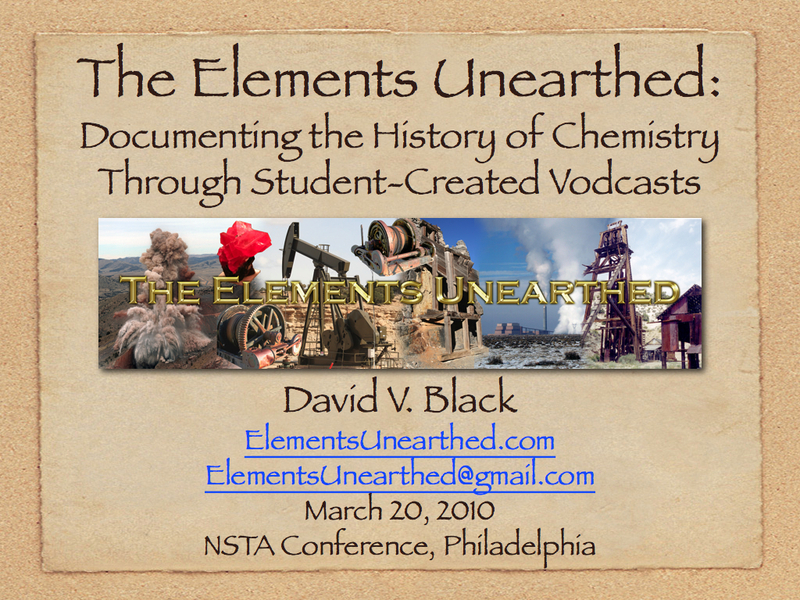 It’s now 11:05 a.m. on Saturday, March 20 and my presentation at the NSTA Conference in Philadelphia is done. Whew! But more on that later. This post will seem to be off on a strange tangent at first, but I will tie it into science education in the end. 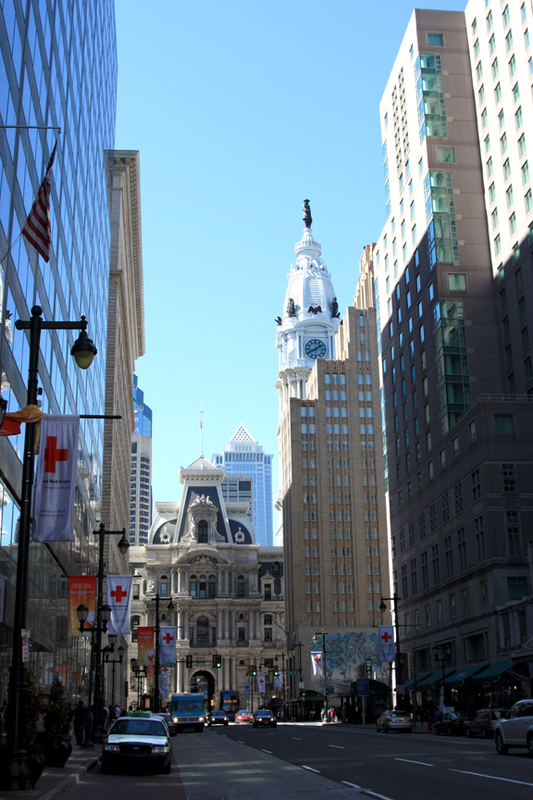 While riding on the Philadelphia public transportation system last summer (SEPTA) I usually took the 101 surface light rail route to the 69th St. Terminal, then the Market-Frankfurt line to the 5th St. stop in the historic district of Philly. I noticed something then that puzzled me – the main line would always bypass certain stops, such as the stations at 22nd and 19th Streets. 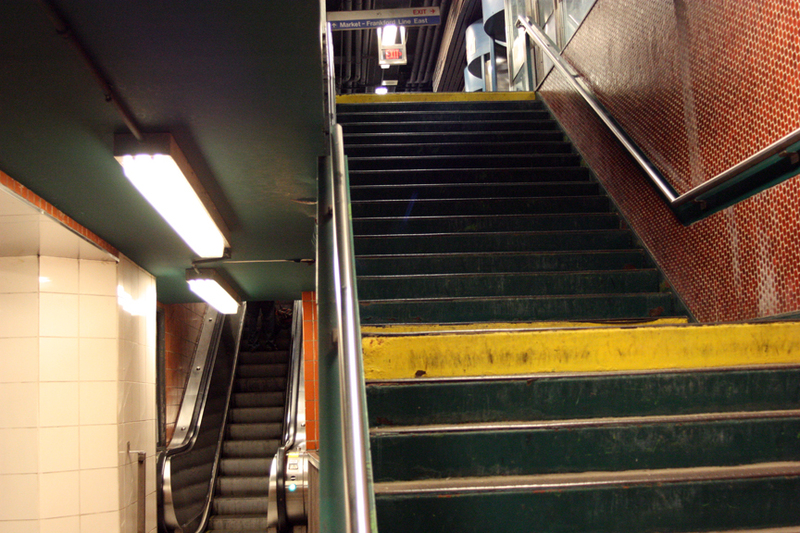 I could see there were stations there, and people waiting, and occasionally a trolley car, but there seemed to be no connection to the main line – a complete system that I only got glimpses of. The last few days, I’ve been staying out in Darby and taking the Route 11 trolley/subway to the Juniper Station under City Hall, then walking to the Convention Center. Now I know what that other system was – a completely different sub-subway, a kind of Shadow Line, that runs parallel to the main subway trains for part of its length. 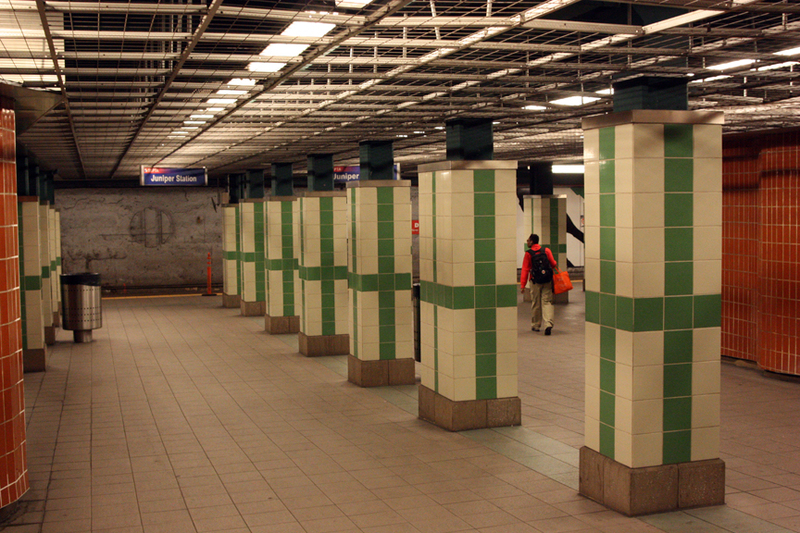 It only connects in certain places, such as Juniper Station, which is under the main 13th street station, at 30th St. for University City, etc. Now I am now one of those people I glimpsed last summer, riding the Shadow Line. 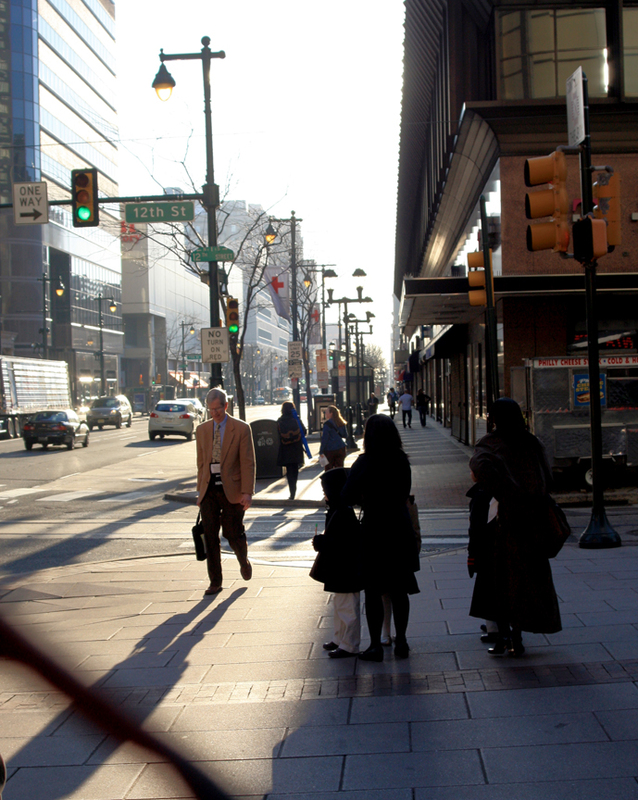 It occurred to me last night, riding back to the friend’s house where I am staying, that education is like the Philly transportation system. 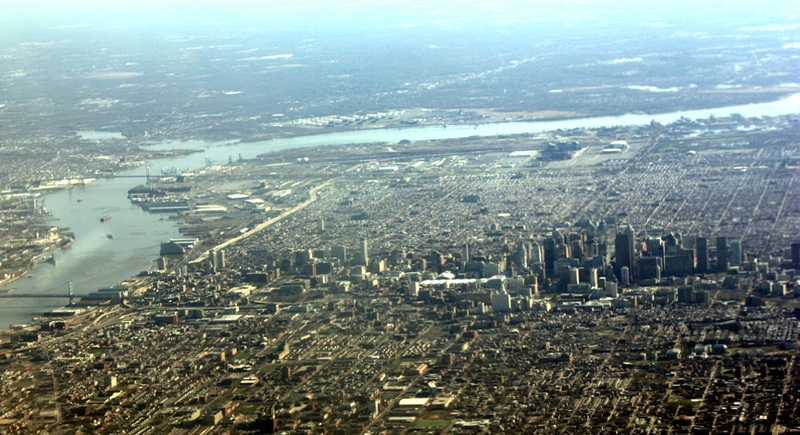 We as teachers are riding the main line train – zooming in and out with our (supposedly) greater knowledge and experience and thinking we know how our students think and where they live, yet we are really only getting glimpses of them in the few places we can actually connect. It is this disconnect that causes most of our problems as teachers (and as a society); we have far too many places where we don’t understand each other, don’t connect, can’t relate, and don’t communicate. Racial strife, the disparity between rich and poor, the digital divide, the generation gap, etc. are all created by the disconnects between individuals and between groups. Education is all about building bridges across these gaps, making the connections between their world and ours. If teachers and other adults are on the Main Line, then our students are on the Shadow Line and our classrooms are the stations. Our job as educators is to connect the lines (lives) of our students with our lines (lives) as adults through our classroom stations. I tend to think of technology as an end-all and be-all of teaching (I”m a techie, after all) but I need to remember that technology is only there to build these bridges and make connections, to give us glimpses into the worlds of our students and their ways of thinking, and as such is no more valuable than any other teaching method or technique. The fundamental thing is learning how to build a community of trust and mutual support and respect in a classroom where students can freely express themselves and learn from each other. Technology can certainly help to do this, but it is only part of a well-constructed and well-taught class. Some of the sessions yesterday reminded me of this fact (especially one by Joan Gallagher-Bolos who teaches an extraordinary chemistry class in Illinois, where students learn to trust and support each other, to speak their minds and make a contribution, as well as learning chemistry). I can only hope The Elements Unearthed project will help build communities of students, in local towns, and across borders. If not so, then just making gee-whiz videos for the Internet is rather pointless. Yesterday was very much about making connections. I attended sessions taught by, or ran into, many friends and associates from my days in two NASA educational programs, the NASA Explorer Schools program, in which I was a facilitator at JPL for three summers, and teachers in the Solar System Educator Program. It’s been over five years since I’ve seen them, but seeing them again has helped re-ignite my passion as a science teacher and reminded me of the communities of teachers I’ve been part of, renewing the connections I’ve had with these amazing educators. A group of us got together for dinner last night and it was as if I had never left the program; they welcomed me back even if only as a visitor. I am still part of their community, just like I will always be from Deseret, Utah even though I haven’t lived there since 1983. I also spent time meeting and building new connections, finding new ways to collaborate, and new ways to build bridges. I”ll post more later today on my presentation. Now I’m going to brave the Exhibitor’s Hall. More connections to make . . . They feature interviews with Dr. Eric Scerri of UCLA, to which I have added my own narration, animations, illustrations, photos, captions, etc. as well as publication artwork and notes by Edward G. Mazurs (see my previous Periodic Tables posts). I have edited the videos into two parts. Part 1 covers the events leading up to Mendeleev’s invention of the periodic table including the work of several precursors such as de Chancourtois, Newlands, Odling, Hinrichs, and Meyer. 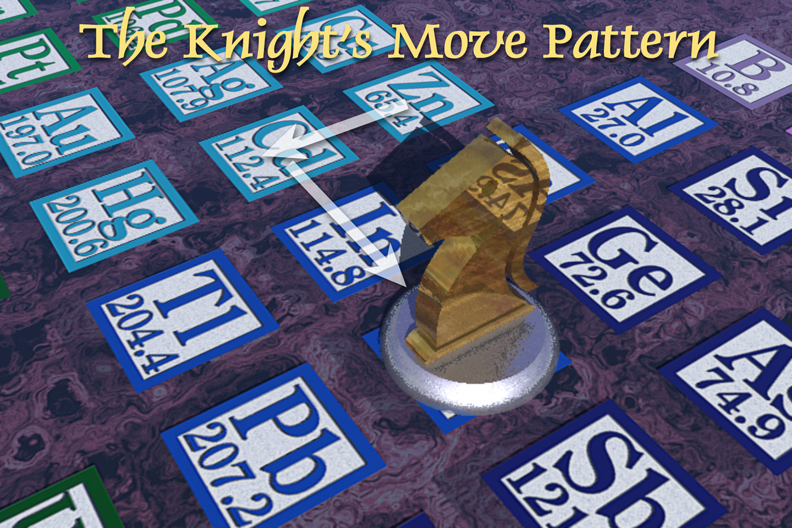 The second part covers Mendeleev’s working out of his periodic system and the work of his successors, as well as some interesting questions such as whether the periodic table can be entirely deduced from quantum mechanics and the mystery of the Knight’s Move pattern of properties. Part 1 is 17 minutes long and Part 2 is just under 20 minutes. I am very pleased with the results; I’ve been using every spare minute to complete the editing which is why I haven’t posted here for so long. I hope you feel it is worth the wait. Please let me know what you think! In addition to placing them into this specific post, I will set up a separate page on this blog just for the completed videos. So far I’ve done the rationale video in two parts, now these two on the periodic table, and more will follow as soon as possible. The next will be on the mining and refining of beryllium ore, then on glass blowing, and so on. I have materials (video, photos, etc.) for about 30 episodes already and will get more as student teams begin to complete projects. I will also post these episodes to YouTube but will have to cut each part in two since you can only do ten minutes at a time on YouTube. I also plan on creating a completely separate website just for these videos so that I can place my own metadata on them and upload them to Apple iTunes as podcasts. As these steps are completed, I’ll post information here. Next week I travel to Philadelphia to present this project at the National Science Teachers Association (NSTA) conference. 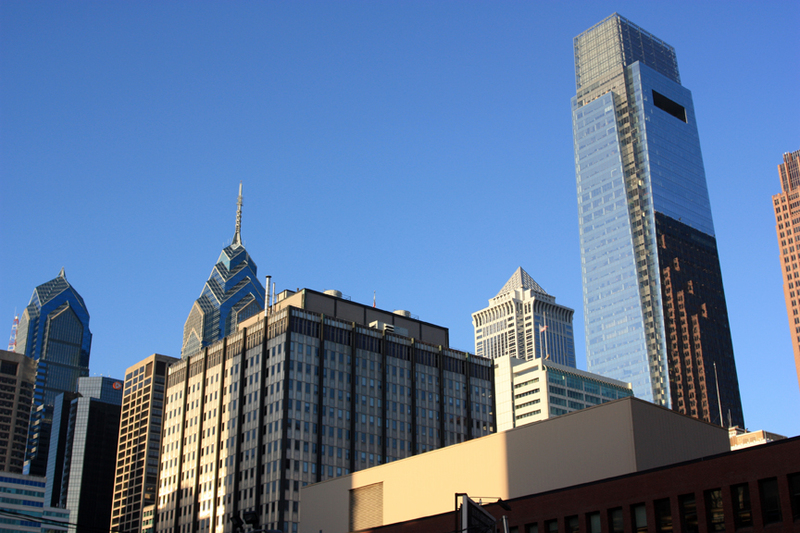 My presentation will be on Saturday, March 20 at 9:30 in Room D-17 of the Pennsylvania Convention Center. I hope to do a few posts from the conference. Looking through the program, I see several names I recognize among the presenters from my years of facilitating educational workshops for NASA, so it will be fun to see them again. 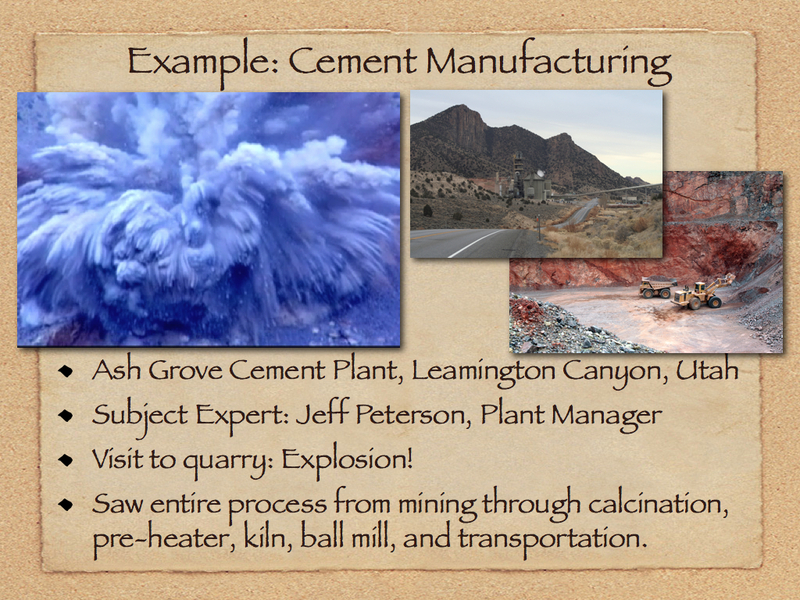 I also hope to work out corporate sponsorship of this project, including funding, so that I can finally begin Phase II to have teams of student in Utah, Colorado, and Nevada start to create their own episodes of the mining and chemical manufacturing in their communities. It will be a very busy week getting ready for the conference. I’ll post again in a few days once all the uploading and links have been created to these videos.